This is my last Empress of China recap :’). I finally completed my first entire drama recap and review. It took me a long time for this last recap but it’s done. My source on Youtube to watch it got deleted, and Edrama was down for the longest time. I did it through MapleStage but their episodes are cut differently from mine, so I decided to make one huge recap because I don’t know how the episodes are separated anymore. WARNING: THIS POST IS SCREENCAP HEAVY. 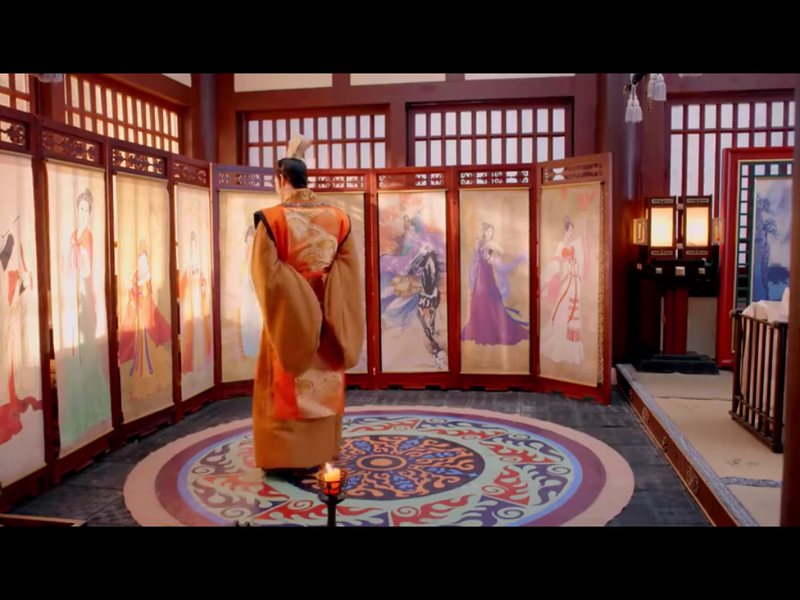 The episode starts out with Qing Shun, Shu Fei’s servant, telling Li Mu that Mei Niang only is eloping with him to protect the current Emperor. She tells him that Mei Niang is afraid that Li Mu would murder the Emperor, so she wanted to get him to be as far as possible from him. 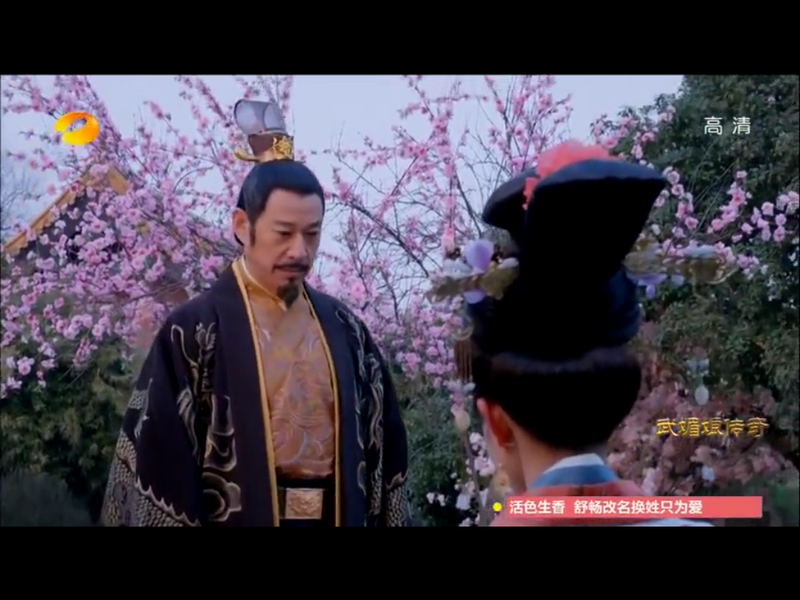 He doesn’t believe this, but Qing Shun asks him to check her packed things – in there he finds the flower that the Emperor shot out of her mouth at the horse-riding festival. Meanwhile all the chancellors are against handing Li Tai the Crown Prince title. 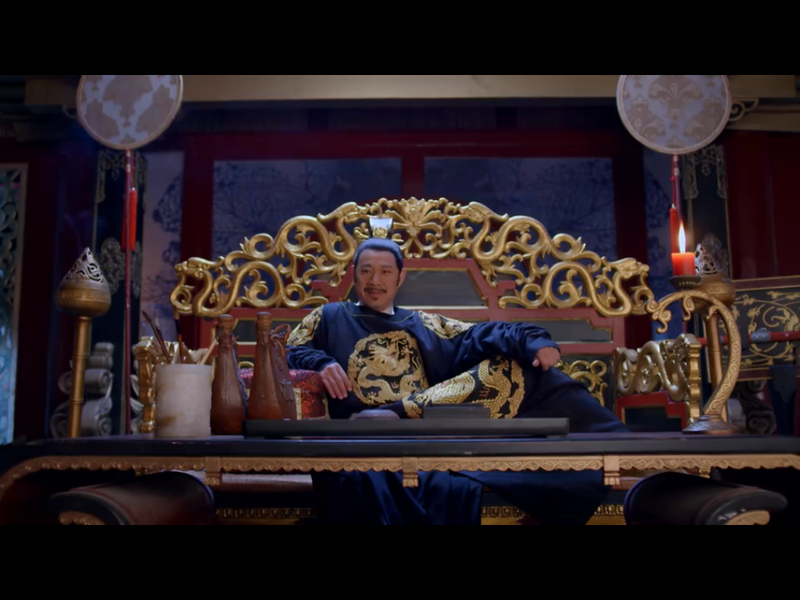 Li Ke tried to be smart – he knew that Li Shi Min did not want to give him the title of Crown Prince because he was afraid that he would murder his brothers afterwards to ensure that the Emperor title can only be transferred down to his sons. 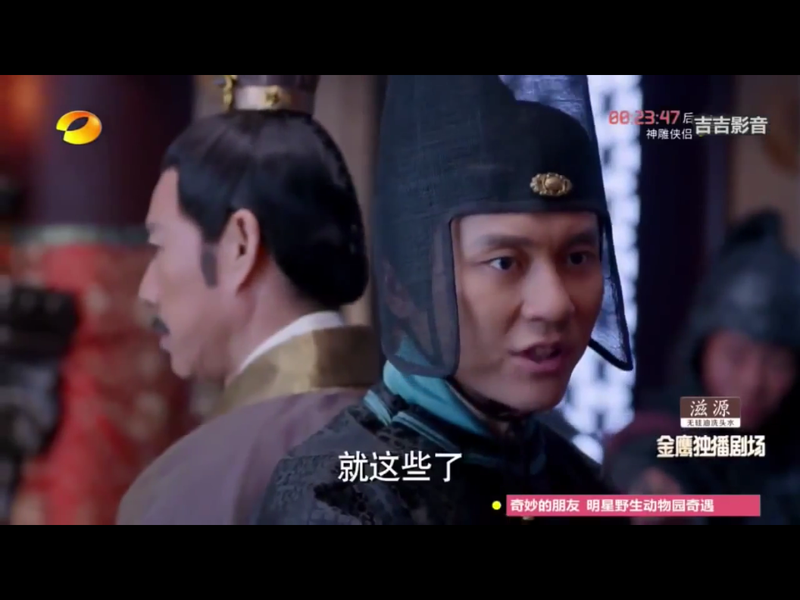 Understanding that, Li Ke approaches the Emperor and offers him a solution: Li Ke tries to promise that he would make Li Zhi the Crown Prince afterwards if he was Emperor. The chancellors are disgusted Li Tai. His desire to become Emperor has gotten so out of hand that he made such backless and impossible promises. There has never been a brother that is been titled as Crown Prince, and it was clear that Li Tai’s sly and manipulative ways made him unsuited for the position of Emperor. Meanwhile, Li Zhi is convinced by Qing Shun (what a sh*t starter) to go console Li Tai about his predicament. After realizing that he would not be Emperor, Li Tai becomes crazy. His thought process is “Ok, you think I won’t give up my throne to my brothers? I’ll show you!” and decided to attempt to murder his children. 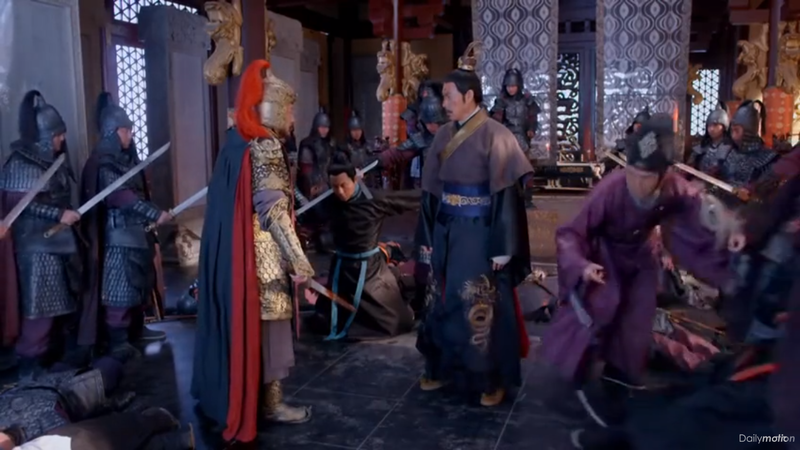 Luckily Li Zhi showed up to stop him, but Li Tai takes Li Zhi hostage to force the Emperor to make him Crown Prince. Since Li Zhi was sent to Li Tai by Qing Shun’s manipulation, this was actually all of Shu Fei’s plan – which is convenient because I feel like that there is no way that she could pinpoint the moment that Li Tai goes crazy and becomes aggravated by Li Zhi. She has already arranged rebel soldiers outside of the north gate and wants Li Ke to let Li Tai in with Li Zhi. According to her plan, she feels like that Li Tai would be obsessed enough with the desire of becoming Emperor that he would murder Li Zhi and Li Shi Min in his hostage-rebellion. That’s when Li Ke would swoop in with his own rebel troops and kill Li Tai, and get the title of Emperor without the judgement of other people (because technically Li Ke didn’t rebel against his father, he killed Li Tai, who rebelled). Li Ke is shocked. He’s been fooled by his mother all along. Shu Fei was already married before Li Shi Min, but Li Shi Min killed all her family members and made her into a fei. Every single day of her life she wanted to kill him to seek revenge for her loved ones. He’s reluctant to do it, but his mother insisted that it was something that she planned and wanted for her whole entire life. 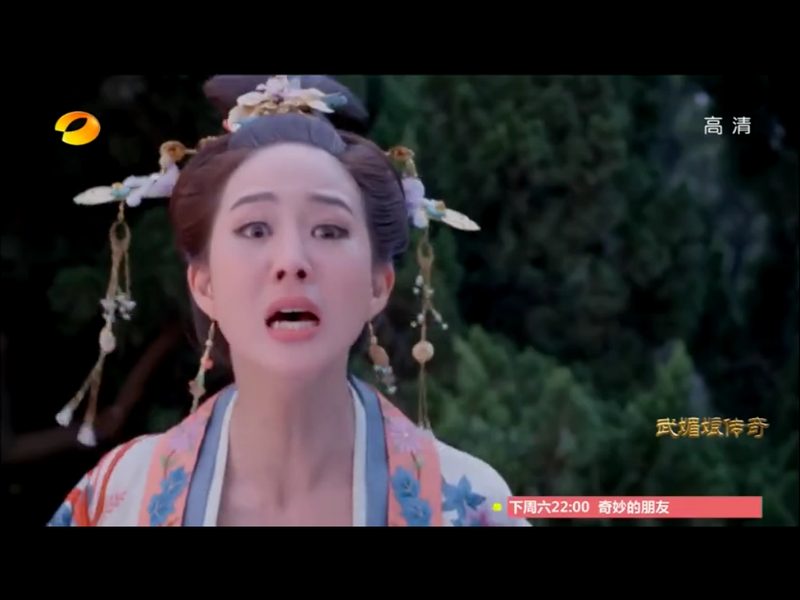 Mei Niang finds out about Li Zhi being held hostage by Li Tai and heads to save him. She confronts Li Ke at the North gate – she saw perfectly what he was trying to because he had so many rebel soldiers with him – he was trying to capitalize on the situation. She manages to convince him out of it, luckily, for two reasons: first, Li Ke did not want to rebel against his father because he’s kind person at heart; secondly, Li Shi Min knew of Cheng Qian’s rebellion early on before it happened. If Li Ke’s rebellion turns out to be botched, then the punishment would be dire. And forreal – Li Shi Min’s soldiers were outside, ready to intervene. So according to the law of ancient dramas, at some point in your life you have to spew blood out of your mouth from internal injuries. 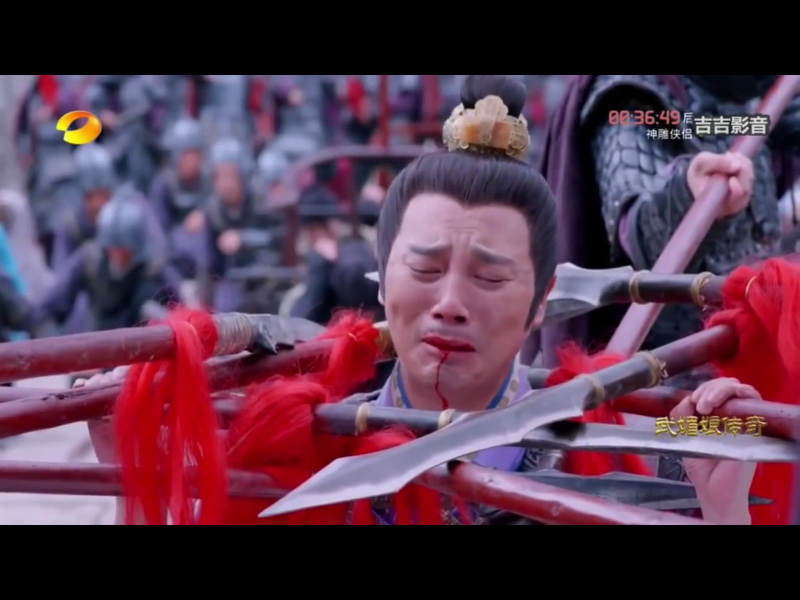 Li Tai is taken down by soldiers (and they pretty much only use the spears to put pressure on his soldiers) and somehow that causes so much internal injury that blood drips down his chin from his mouth. 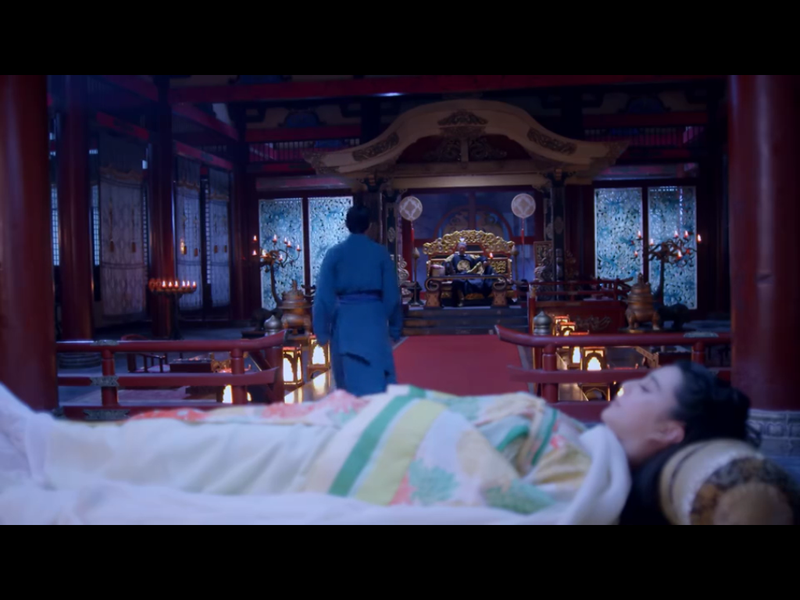 Shu Fei commits suicide after she finds out that Li Ke did not rebel. This was her life long wish and now she’s also in trouble for recruiting rebel troops. She immediately spews up blood after drinking poison. She tells Mei Niang that not all is lost – she has sent Li Mu to murder to the Emperor. Except he doesn’t. He… defends him?! 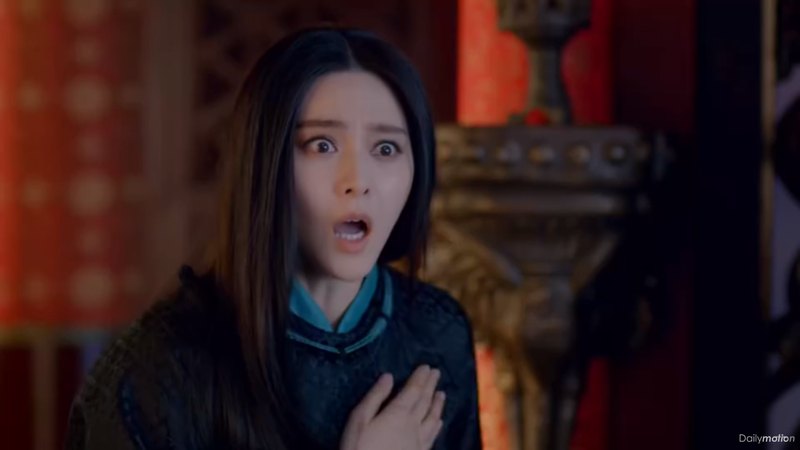 Yes, Mei Niang, I had the same reaction when I realized that Li Mu was doing such a ridiculous thing. Li Shi Min killed your family (burned them alive, no less), and Li Mu offers no explanation for why he did so. When Li Shi Min asked him what he wanted to be awarded with, he said “Mei Niang”. Hellooooo you could have just killed Li Shi Min all the same, and you still would have gotten Mei Niang + the bonus of avenging your family. Maybe feels like that she wouldn’t leave with him if he killed Li Shi Min? But he killed your family! HE BURNED YOUR MOM AND DAD ALIVE!!! I think that’s more important than Mei Niang’s wishes or love at this point. Li Shi Min rewards Li Mu with poisoning him as well as Mei Niang because she kept pleading for his release. Li Shi Min didn’t like the thought of his woman and another man sacrificing for each other. …PSYCHE. Nope, he didn’t kill her. Mei Niang wakes up dressed like a boy outside the palace. Turns out, as Li Shi Min told Li Mu, he loves Mei Niang a lot, and he only wants her to be happy. 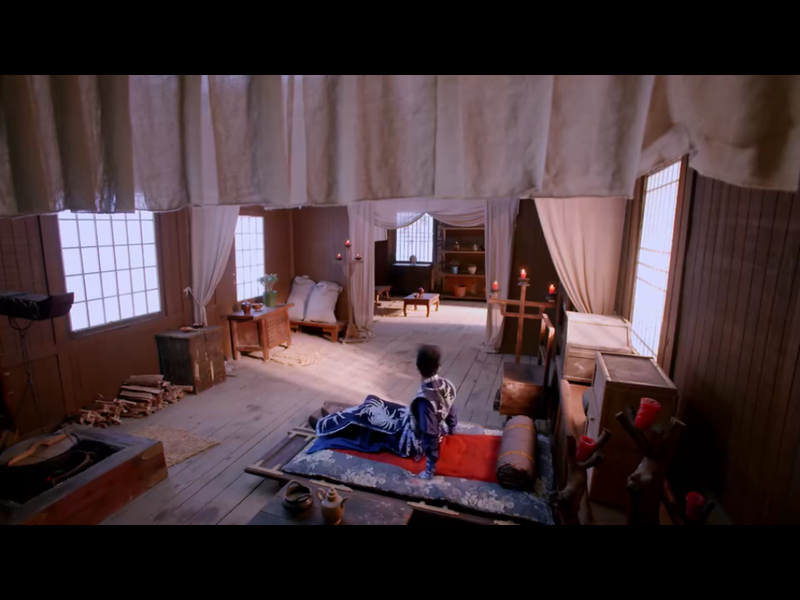 Li Shi Min is convinced that Mei Niang loves Li Mu and he wanted to set her free. Li Shi Min feels like that he’s getting old, and he’ll die in a few years, but Mei Niang is still young. He couldn’t bear to see her to spend the rest of her youth and years at a temple. So, he set her free. You gotta admit, that’s very, very sweet. 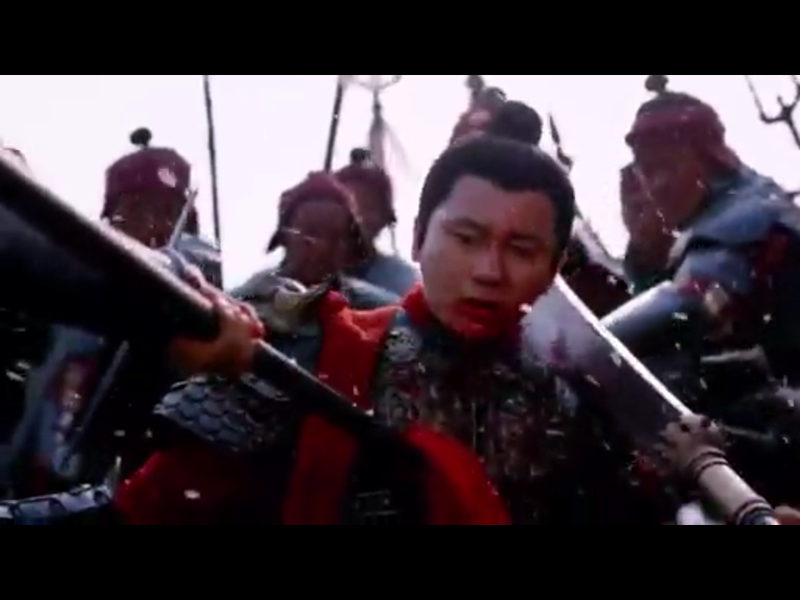 Li Shi Min proceeds to head out to war afterwards. He’s supposed to be one of the better Emperors in the history of China – and I think the actor that plays him does a really good job. He does give off this very wise and reassured vibe. Li Mu allows Mei Niang to make a decision to choose him, or to just be free. Obviously, Mei Niang makes an extremely questionable decision to go find Li Shi Min. Wait, what?! You just escaped. And he’s in war. What could that possibly accomplish? Also, what are the chances that Mei Niang bumps into Li Ke and his troops in the vast lands of China? Very unlikely but you know, drama. Li Ke and Li Shi Min are travelling in separate troops, and Li Ke is going to regroup with Li Shi Min. During the war, the Emperor gets ambushed by the enemy by arrows and they create a fort around him to prevent him from getting hurt. The Emperor is the only one left in the troop at this point, and the enemy is fully targeting him now. The enemy soldiers are moving in on foot, as well as firing rounds of arrows around him. Mei Niang and Li Mu somehow got to the Emperor before Li Ke (how?!). Mei Niang and the Emperor meet again and somehow have a good two or three minutes to look at each other romantically (ok at this point the enemy soldiers deserve to lose because they’re not firing rounds of arrows at this clear target). So the enemy soldiers come by and attack Li Mu. There are literally 15 guys on Li Mu while Li Shi Min and Mei Niang get away on a horse. Like c’mon guys, no wonder you’re losing. What the heck are you thinking? I’m pretty sure two guys can fight Li Mu while all the other ones focus on killing the actual Emperor of the Tang Dynasty. Meanwhile, as Xu Hui is now Xian Fei, and the leader of all the concubines in the royal palace, she uses cruel measures to control the other concubines and the servants. Li Zhi gets married to Wang Yu Yan out of an arranged marriage. I think Yu Yan is actually quite pretty, but unfortunately, Li Zhi is still enamoured with Mei Niang. 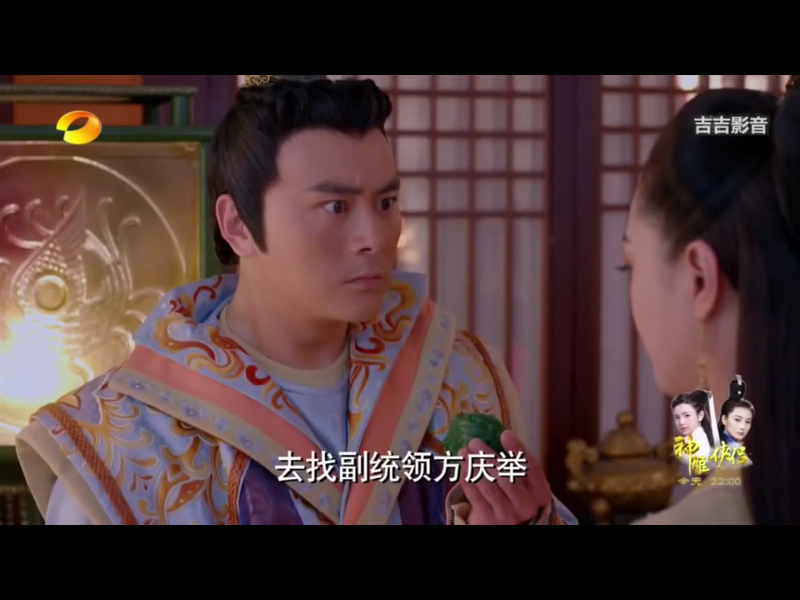 He shows favouritism to Consort Xiao because he sees a resemblance with her and Mei Niang (which I do not see at all). Mei Niang leaves for a few years, and for those years, Li Zhi looks at ‘paintings of her’ (which arguably looks nothing like her, but what do I know?). 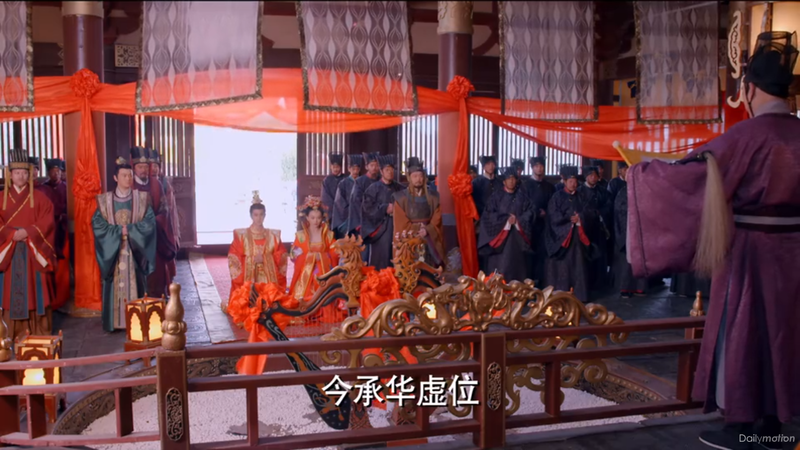 Mei Niang returns to the palace with Li Shi Min after the war. Xu Hui finds out by surprise. She goest to the Emperor’s personal chambers to look for him, and she turns around to find Mei Niang. Before this, Xu Hui thought that it was finally time for the Emperor to focus on her, and only her – and when she saw Mei Niang, you could see her face crumble into sadness, and she was trying so hard to fake happiness. Mei Niang tells Xu Hui where she’s been all these years. Mei Niang reunites with Rui An and he’s honestly my favourite character. He’s been waiting for Mei Niang for all these years, not even knowing if she’s alive or not. He’s been cleaning her room diligently without a speck of dust. He eats alone in front of Wen Niang’s old personal sleeping chambers because he misses her so much, and still insists on checking the bottom of each candle holder to try to find her murderer. He is just so sweet and loyal. After Xu Hui finds out from Mei Niang that she was actually with the Emperor during the war the past few years, she decides to release the information because it’s a death penalty for women to be at the warfront with the soldiers. She invites Rui An to her personal chambers to trick him to get a written sample from him so she could pin the leaked information on him instead. 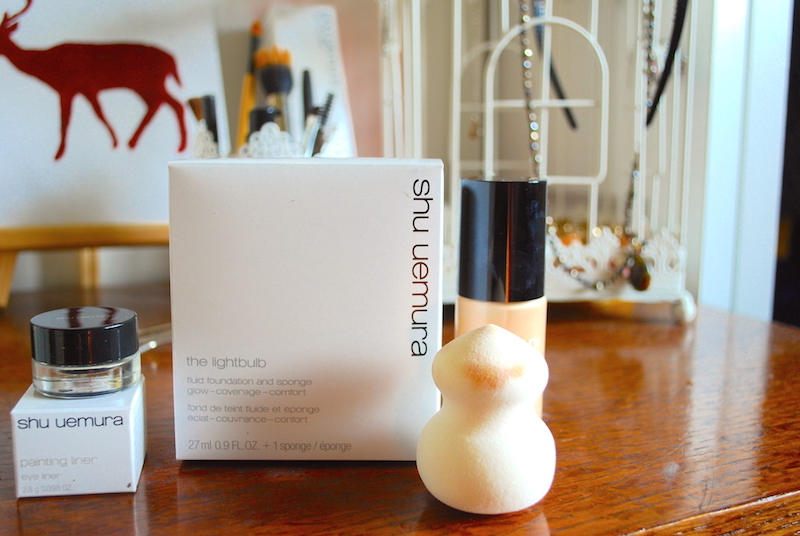 Coincidentally Rui An finally finds the candle holder with Wen Niang’s name carved on the bottom of it. Rui An confirms that Xu Hui is Wen Niang’s murderer, and also Xu Hui had betrayed her. She intentionally mislead Xu Hui to think that Rui An knew about where she was these past few years, but really, Xu Hui was the only one that knew. As a result, all the chancellors wait outside the personal chambers of the Emperor to beg him to get rid of Mei Niang, because firstly, what she did deserves a death penalty, and secondly, they still believe in the prediction that she will be the downfall of the Tang Dynasty. Mei Niang meets up with Li Yi Fu for the first time. She sympathized with his position within the courts as a common chancellor, being bullied by the elites for the rest of his life. She offered to be his support in the royal palace. He declined since he doubted that she would make it through the night, and offered to follow her if she survives. Mei Niang could only do one thing – she offered to be married off with Princess GaoYang as a servant and never return to the royal palace. 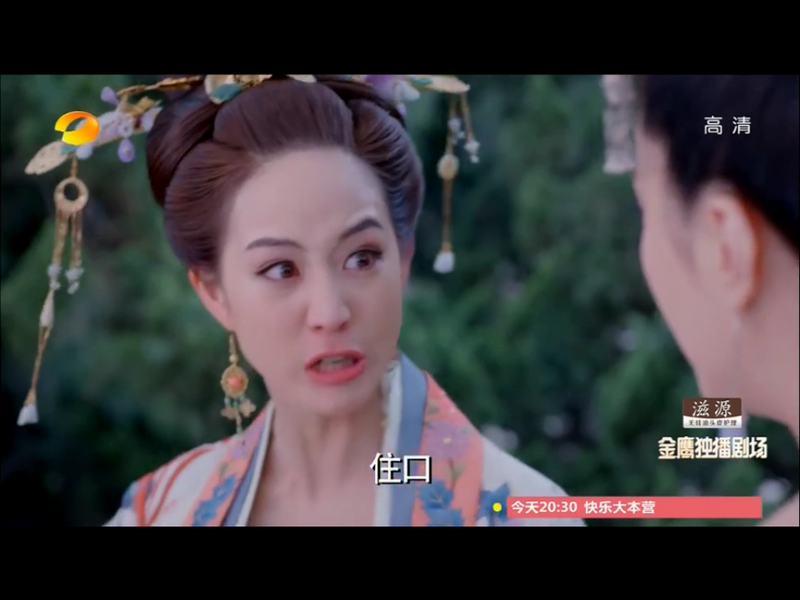 Before Mei Niang is sent off, she confronts Xu Hui in the garden about all she’s done. Xu Hui admits to everything and goes full crazy. Her hair bugs me so much – how hard would it have been to dye it black? I can clearly see where her hair ends and where her wig starts. In the first time in 50 episode we finally see Mei Niang get mad instead of just crying. She says “If you dare hurt me again, I’ll return it back to you, tenfold”. Thank god she’s standing up for herself – finally. 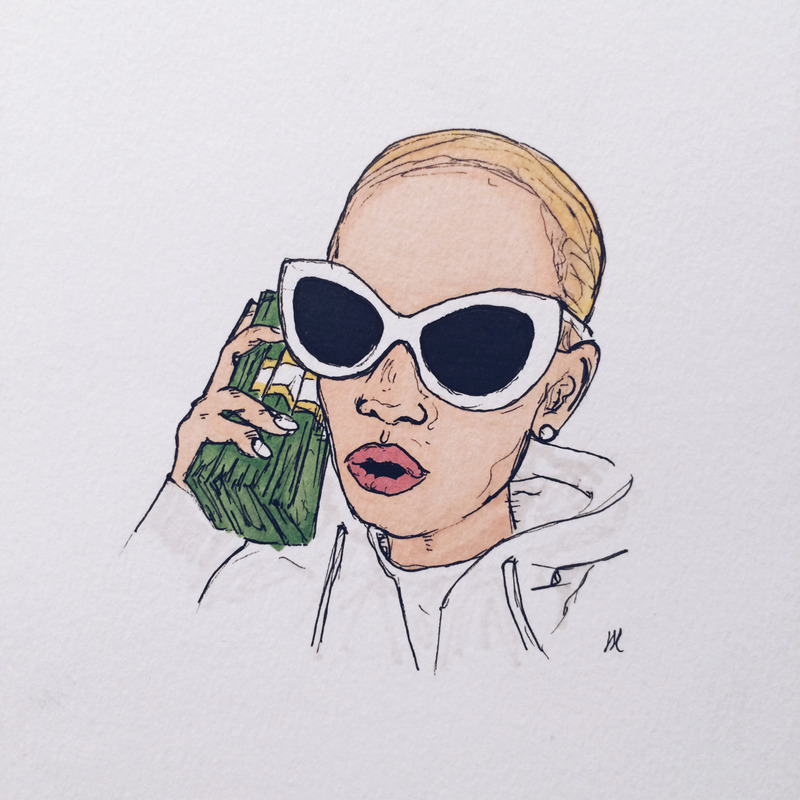 …and she did. Mei Niang got her revenge by actually getting the Emperor to go to the garden where her and Xu Hui were arguing, so he could hear her confession. I think this was probably the worst thing that could happen to her – to ruin Xu Hui’s image with the Emperor so the Emperor couldn’t possibly see her again. The Emperor’s love and her status was all she ever prized – and the Emperor took that away from her. He sentenced her to be all alone in her personal chambers with no servants nor power, and he never visited her again. Princess GaoYang hated her arranged husband, and she was in love with a monk, so she decided to elope with him. This is really what I don’t get – why couldn’t the producers make her fall in love with a normal guy? It makes their relationship so absurd – I mean, he couldn’t possibly return her love back unequivocally because of his commitment to his religion, so why was she so adamant on their love – why did GaoYang do such horrible things afterwards for him? Zhang Sun Wu Ji knew that Mei Niang still had ties with Li Yi Fu, and knew that Mei Niang was still planning against him. She had to, because Zhang Sun Wu Ji still wanted her dead because of the predictions. Zhang Sun Wu Ji knew of Princess Gao Yang’s plans to elope early on, so he decided to set up a trap because he knew Mei Niang would help. He decided to use this as an opportunity to prosecute Mei Niang for aiding with the elope. Mei Niang gets imprisoned with the rest of the servants that knew of the Princess’ plans to elope. They don’t elaborate much on that – they just show a scene of her being pushed into a room with the other servants – like does she end up living there with them? Or does she get punished? Is that it? It was a pretty sloppy resolution of that. The Emperor falls into a deep sickness. And finally, nearly 60 episodes later he dies. The real Empress Wu actually did not spend so much time with the Emperor in history, so nearly all the events in the first 60 episodes are fabricated. We only spend 36 more episodes on true (or truer) events at least. And that’s it! 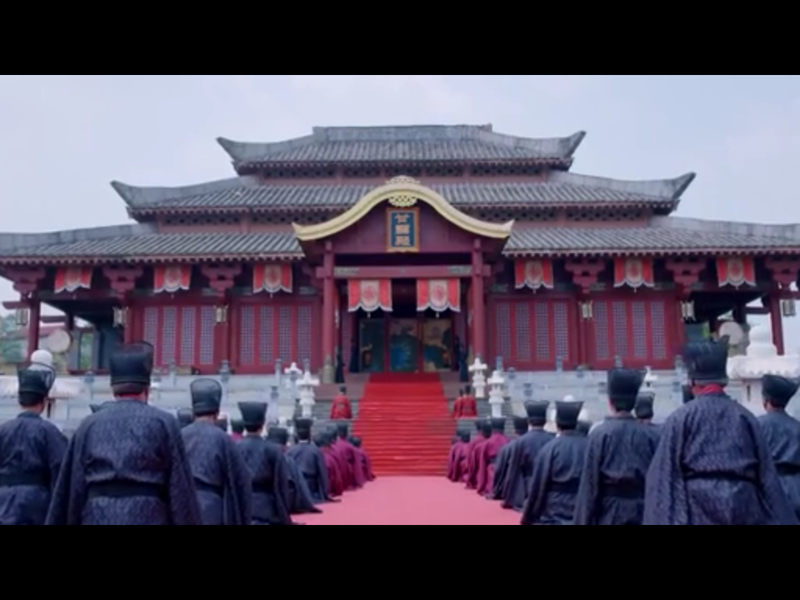 All the Empress of China episodes are recapped and all the important events are highlighted.